The historic Abuhav Synagogue is one of 60 in Safed where the Tikkun Leil Shavuos will be recited on the first night of the festival. The first night of the festival of Shavuot is not one for sleeping in Jewish communities around the world. It is the night when Tikkun Leil Shavuot(rectification of the night of Shavuot)—a specific text comprising written, oral and mystical aspects of the Torah—is recited, followed in many places by study and classes until dawn. In the holy city of Safed, Israel, where the text of the Tikkun originated, the electric aura of the holiday is almost palpable. 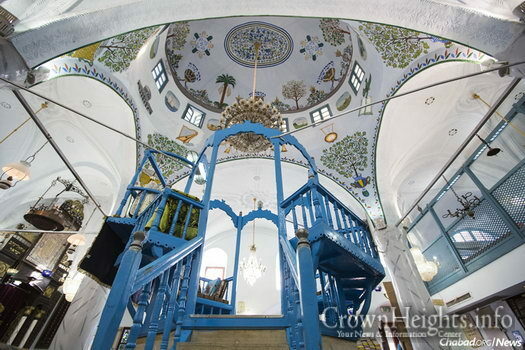 Several of the most famous synagogues in the world are located in Safed. There is theAri Synagogue, named after Rabbi Isaac Luria, the preeminent Kabbalist; The Beit Yosef Synagogue, named for Rabbi Yosef Caro, author of the Shulchan Aruch (Code of Jewish Law); The Ari AshkenaziSynagogue, located in a field where Rabbi Luria would bring his students out to greet the Shabbat Queen; The Tzaddik HaLavan, the oldest of the Sephardic synagogues in Safed; and the Abuhav, named after RabbiYitzchak Abuhav, a renowned 15th-century Spanish rabbi. Tradition claims that he designed the synagogue while still in Spain, incorporating Kabbalistic symbols into the structure. 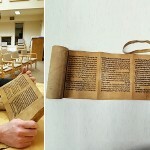 “The Abuhav Synagogue is even more unique in that it has a 500-year-old Torah scroll that is still kosher,” notes Chaya Brocha Leiter. “This is parchment and ink. The parchment is gray, and the ends have fringes. And what is so miraculous here—aside from it still being in existence at all—is that each and every letter is still whole and kosher. Services and classes will also take place throughout the night at these sites, and at Chabad of the Old City, where Rabbi Gavriel Marzel will lead study sessions for dozens of residents, students and visitors from around Israel and abroad. More than 100 guests are expected to join the Leiters at Ascent for night-long study. 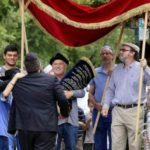 Chaya Brocha Leiter, program director of Ascent—who leads classes and tours throughout the year on the “who’s, where’s, what’s and why’s” of Safed and its history—explains why the Tikkun is associated with the city. After Rabbi Caro’s arrival, the entire community adopted his practice of learning throughout the night on Shavuot—an ancient practice mentioned in the Zohar and only undertaken by a small number of select individuals. After a few years, leading Kabbalist Rabbi Moshe Cordovero—who was Rabbi Alkabetz’s brother-in-law and was also living in Safed—adapted selected verses from Tanach and Mishnah that had been studied, and created a specific order of study called Tikkun Leil Shavuot. It included the first sections of the Five Books of Moses, then sections from the Prophets and Writings, including “Song of Songs,” Ruth and Psalms; sections of the Mishnah; the poem “Azharot”; and in the end, portions from the Kabbalah, including the Zohar. A version of the Tikkun was also formulated by the Arizal, Rabbi Isaac Luria, and conveyed by his disciple, Rabbi Chaim Vital, in Shaar HaKavvanot. Later, the renowned scholar and Kabbalist Rabbi IsaiahHorowitz, known as the ShelahHaKadosh, changed the order somewhat to include readings from all the books of the Tanach and theTalmud, as well as made other minor changes. This basic order established by the Shelah stands as the text of Tikkun Leil Shavuot used today in almost all Jewish communities. 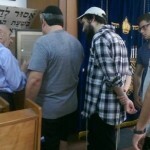 A Rosh Hashanah Miracle on Bograshov St.